Welcome to ish onCourse. To help you use onCourse comfortably, this section will demonstrate the various windows, lists, records and other icons you'll see. onCourse is designed to be and flexible and easy to use, and you can have it set up to help you complete your tasks. onCourse is customisable, so you can tweak the windows and layout for your own use. Once once you find something you like, you can keep using it. To help you with this, onCourse will open using the layout as your preference the next time you open it. onCourse has been designed as a process oriented software program, which means its set up to help you complete your work as efficiently as possible. onCourse has many functions to assist providers in completing their tasks, including financial, marketing and reporting functions. Each of these functions has its own area, and will be discussed in more details below. 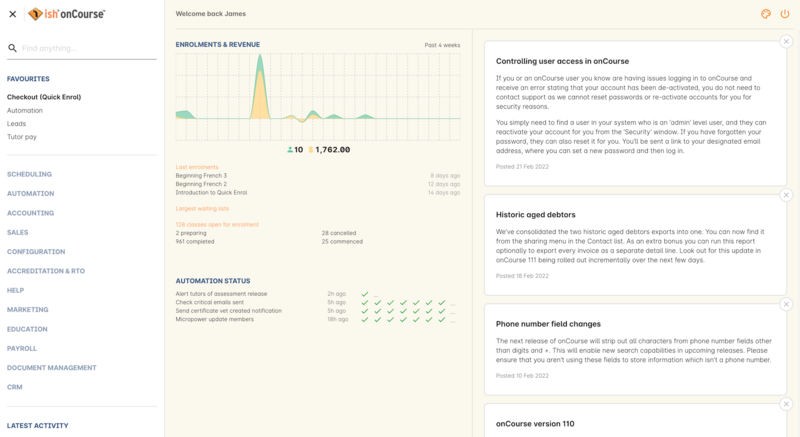 The dashboard is the opening window of onCourse; it is the first thing you will see on your screen after you successfully login. 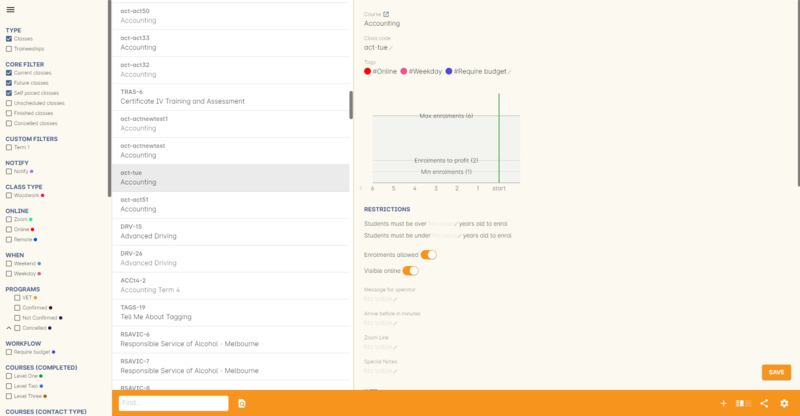 The dashboard is made up of a three-column view window with a quick access column containing two sub-tabs on the left (Favourites and All), a latest activity column in the middle, and an enrolments & revenue column on the right. There is also a logout button, a button to change your visual themes and, in some cases, and an Upgrade to onCourse Pro button for anyone using the free version of the software. Columns can be resized by hovering your mouse over one of the cut-off lines, then clicking and dragging either left or right to decrease or increase the size of the column. This column is the best way to gain one-click access to almost all the different areas of the application. Initially, Favorites will only show Quick Enrol, however if you click the Edit button it will change to say 'Save' and all the windows you can reach from this section will be displayed. If you hover your mouse, you'll see a heart icon appear next to it. Click it to add that window to your Favorites window, and click it again to remove it. Click 'Save' to save your changes. Quick Enrol will always appear in Favourites. This column will save and then display a history of the most recent records you've interacted with and their list views, including during previous logins, acting as a quick way to revisit screens you were just using. You can click any of the displayed windows or records to go directly to it. 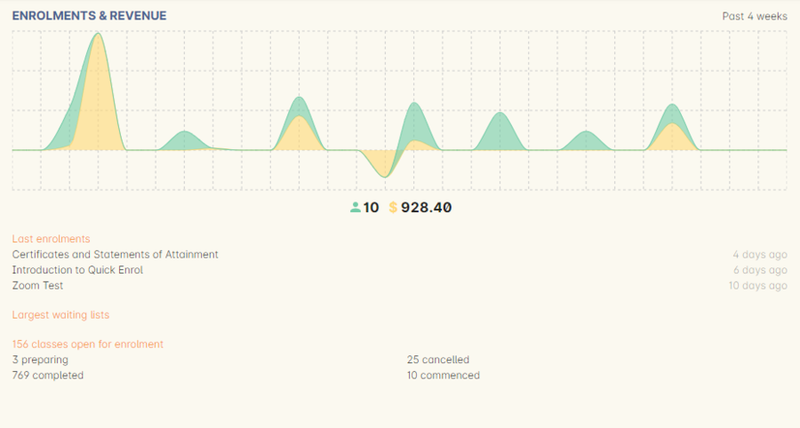 This column will give you a simple, graphical representation of your recent enrolments and revenue from the past four weeks in an easy-to-read graph. As well as the visual graph, you'll also see the raw numbers of enrolments and revenue, as well as a breakdown of the number of courses you have set up in the system. The course breakdown will show you the last courses enrolled in, the number of courses open for enrolment, and a detailed look at the number of courses currently classed as in development, cancelled, commenced and completed. At the top of the Dashboard, you'll find a powerful new search box called Find Anything. Here you can find all manner of data in onCourse and have it accessible at your finger tips with only a few keystrokes. 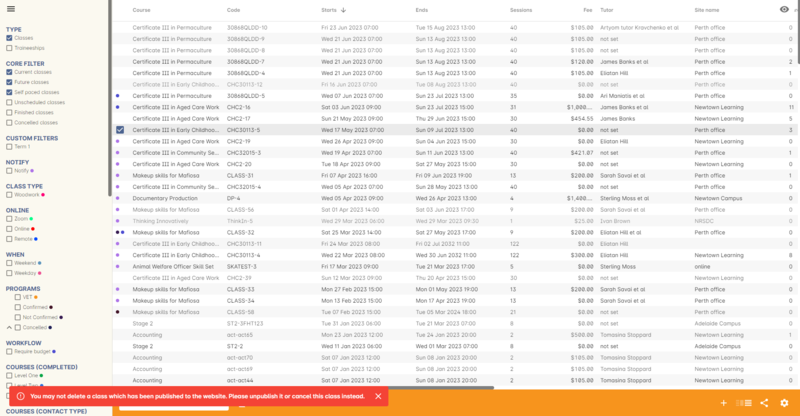 Simply type in what you're looking for, be it a contact's last name, a course code or even an invoice number and the search results should populate as you type, filling out with any matching result. Feel free to experiment with what you can search for, it covers a lot of data! The Themes and Logout icons. In the top-right of the Dashboard there are two new icons, Themes and Log Out. Log Out is self-explanatory, click this to log yourself out of the system and return to the main login window. Themes will allow you to select from the two currently available, Light and Dark. This setting is saved for each user, so if multiple users use onCourse on the same computer, it will remember their preferred setting. 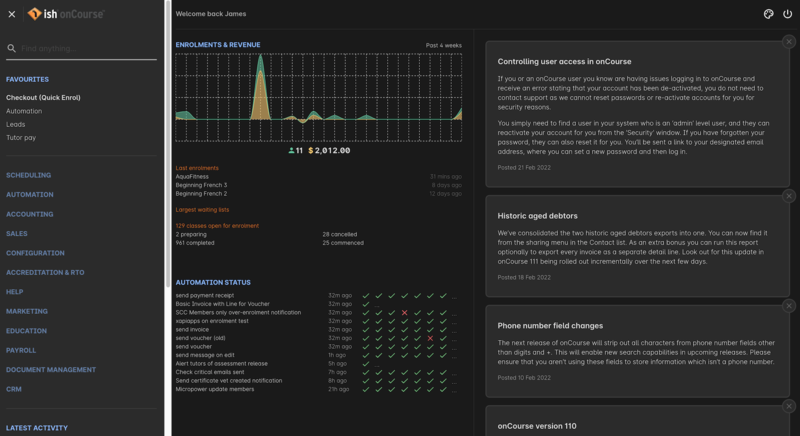 onCourse's list views appear when you open a window. 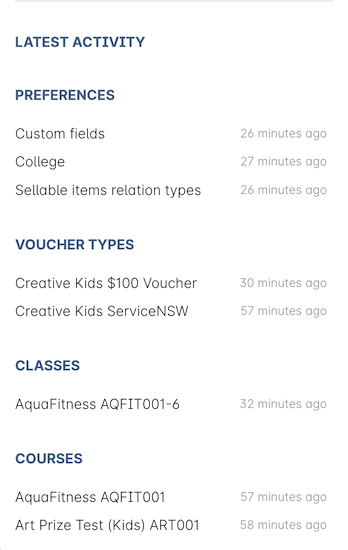 For example, if you click on "Class" on the home screen a list view will be opened showing a list of the current classes in onCourse. This list is filtered by core filters that by default, hide classes that are complete or cancelled. In the header bar of the window you will see how many records are displaying in the list based on any filters or search options running e.g. Classes (38 shown of 267). The list view contains columns relevant to the window you have opened, e.g; if you open the "Class" list view, you will see columns with headers like "sessions" "fee" and "tutor". Click on a header to sort by that column alphabetically. You can click the column heading again to sort by reverse alphabetical order. Some columns can't be sorted by, because they are calculation results e.g. the column 'Enrolments' in the class list is a calculation of all the current active enrolments in the class. Column size can be adjusted to your preferred width. 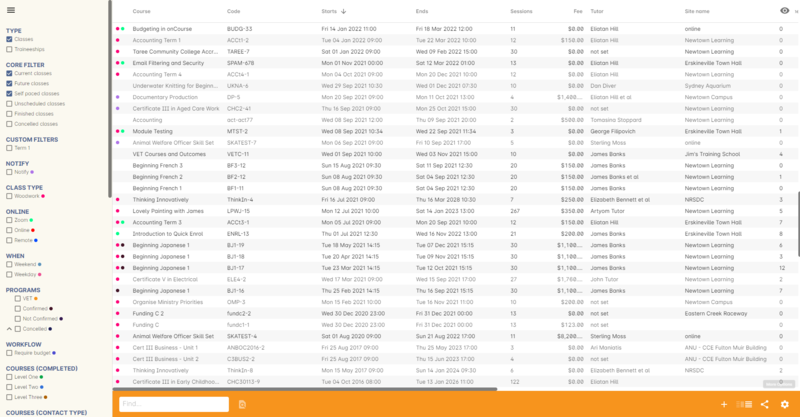 You can also drag and drop columns in the list view to re-order them into a display order of your preference. Your window size and layout preferences are saved as part of your unique user log in. On the left panel of the list view window are filter options. These filters allow you to search for data in the list according to characteristics like "Current classes", or subject tags you have defined. You can resize this panel by clicking on the separator line and dragging it either left or right within the window. Many list views will allow you to choose between a two-column and three-column view. The three-column view will give you a detailed look at a specific record, while the two-column view will give you a better overview of more data. 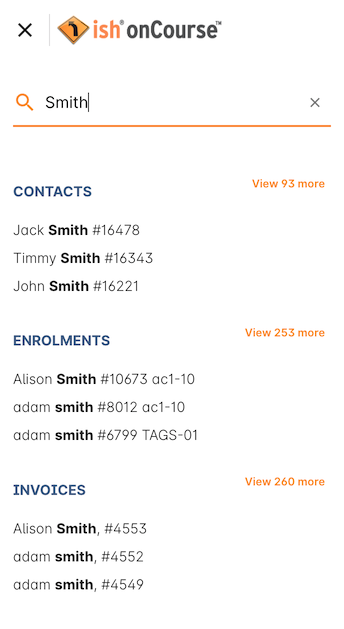 Within the two-column view you can customise the columns visible to you by clicking the eye icon that appears, and then selecting the columns you want to be visible. The column select pop-up visible in the two-column view. Advanced and simple searches are also available from the list view, and all record printing or exporting happens from the list view. The cog wheel function also has list of specific functions available when inside this list. You can select one record from the list, or a group of records in the list and using the cogwheel, perform a bulk action on the records you have chosen. The list view is also where you can add and delete records. On most list views, you will see both an add (+) and remove (-) symbol. Click on the add symbol to create a new class and fill out the fields and options fulfill the criteria needed for that particular record. To delete a record, highlight the record you want to remove, click on the remove button and the record will be deleted. Some records in onCourse can not be deleted because they have formed relationships with other onCourse records, and it doesn't make sense to be allowed to delete half of a record relationship. For example, if you try to delete a class with one or more enrolments in it (even if those enrolments have been cancelled), you will get a message like the one below. In this instance, you would need to cancel the class instead of deleting it. However, if you tried to delete a class without any enrolments, you will see a message like the one below. Once you select 'delete' the record will be permanently removed from the database. 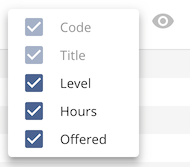 In a list view, you can select single or multiple records. To highlight a single record, single click on it. To choose a series of records, single click on the first record, hold down the Shift key and single click on the last record. The list of records you have chosen will be highlighted. Windows: Control plus left mouse click on each record you want to select. Mac: Command plus left mouse click on each record you want to select. For all printing of report or exporting of data you need to first select the records in one of these ways. Once you have selected the records you wish to work with, choose the share icon from the list view to export the data. Once you click on the icon you will see a list of print or export options available in that window. In the list window, you can also sort by multiple columns at once, by holding down the shift key and clicking on multiple column headers. The sort order is determined by the order the column headers are clicked upon i.e the first column clicked is the primary sort order, followed by the second column clicked and so on. Your sort record is the order used to print or export data in most ungrouped onCourse reports. The cogwheel is a powerful and very useful tool in onCourse, as it can execute a range of complex tasks on groups of records that would otherwise take a while to achieve manually. The cogwheel appears on most screens in onCourse, and the options that appear under it will largely be contextual to the screen you're viewing. 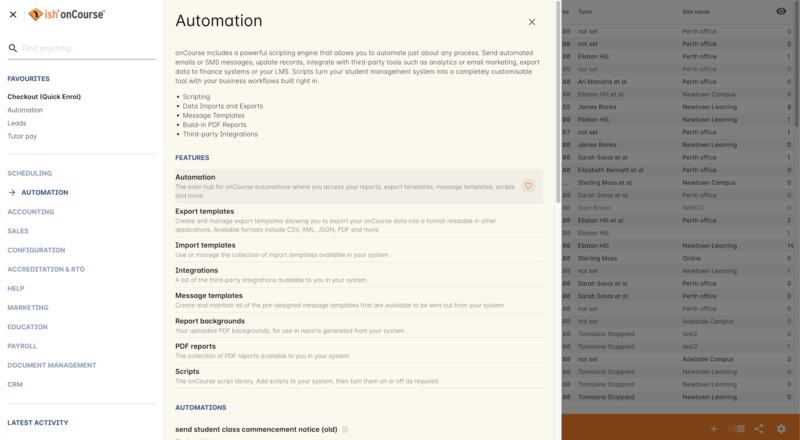 You can manually execute scripts, duplicate classes and courses, send messages to contacts, add or remove classes from your website and whole lot more. To use the cogwheel, highlight a record on the window you're viewing, then click the cogwheel icon to see your options. 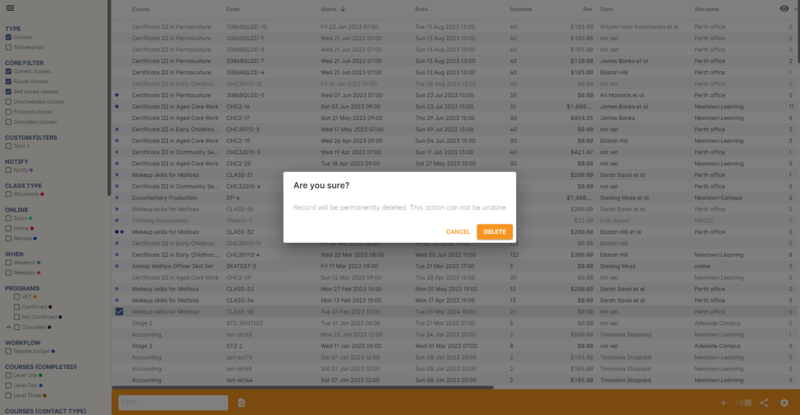 The onCourse record view appears once you open (double-click) on a record in a list view. It is how you edit things like contacts, courses, classes etc and contains tab groups. Depending on what kind of window you're in, there will be different tabs present. Let's take a class record view as an example. To see a record view, go to a window like "class" and double click on a record in the list view. The screenshot below shows you what to expect in a typical class record view, remembering this varies depending on what kind of window you are in. All windows are laid out similarly in onCourse, with tabs to group related data and navigate inside the record. But the class record view alone is not enough to get an idea of how tabs work, throughout this documentation, there are detailed explanations of what each record view tab means, for example see the Classes chapter to learn about class record view tabs in detail, or see the Tutors chapter to learn about tutor record view tabs. Next: If you press this, the very next record in the list will load its data into the record view, this will basically close the record you were just looking at and replace the data with the next record in line. Note that this could take a few seconds as it is bringing up a lot of data from the record. It's a faster way than closing the current record view and opening another record view. If you have made any changes to the record, you will promoted to save before moving forwards. Previous: Like the "next" button, pressing on the previous button will load the previous record or the record before the record you are currently viewing. You may be prompted to save first. Cancel: After clicking on this button, you will be asked if you want to discard changes or save changes. Discarding means you are not saving you changes on closing. This will only occur if you have made any changes, otherwise the window will just close. Save: This button will save your changes to the record and close, it won't ask you for anything unlike the "cancel" button. When you close a record view, you will returned to your previous list view. If you are confirming class details for a student on the phone, they may want to know more about the units of competency assigned to the course. This little icon will appear to the right for the name of the course, simply click, check the course VET details in the window that pops up, and choose cancel when you have completed viewing the record. The screenshots below illustrate this process. This icon is actually very small in the onCourse interface, so we blew it up a bit to get an idea of what you are looking for in onCourse. When you see this icon, click on it to open the related record. For example, if this icon is near a students name "John Smith", then click on it and "John Smith" record will appear for you to edit. This is an example of the open related records icon in action, as you can see it is small and to the right of the row. 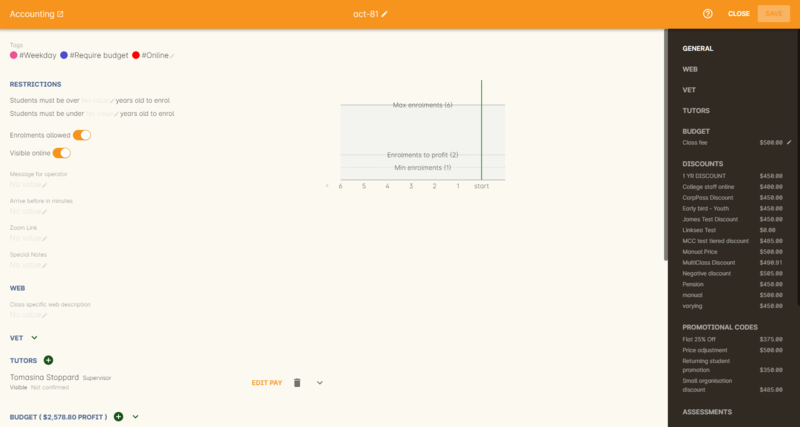 In this screenshot, the "Course" record has been opened while editing a class. It creates an interlacing experience, once you get used to using it, it can prove to be a very useful and powerful tool.